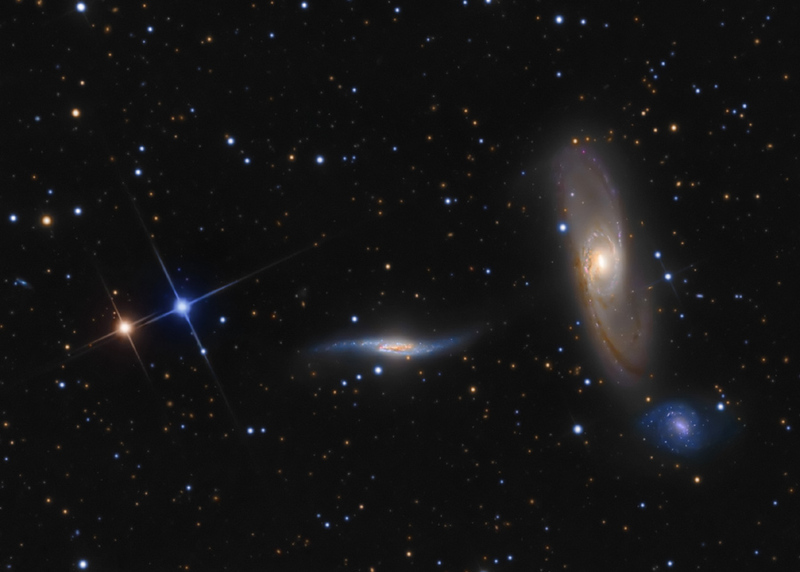 Explanation: A remarkable telescopic composition in yellow and blue, this scene features a trio of interacting galaxies almost 90 million light-years away, toward the constellation Virgo. On the left, two, spiky, foreground Milky Way stars echo the trio galaxy hues, a reminder that stars in our own galaxy are like those in the distant island universes. Predominately yellow, with sweeping spiral arms and dust lanes, NGC 5566 is enormous, about 150,000 light-years across. Just below it lies small, blue NGC 5569. Near center, the third galaxy, NGC 5560, is multicolored and apparently stretched and distorted by its interaction with NGC 5566. The galaxy trio is also included in Halton Arp's 1966 Atlas of Peculiar Galaxies as Arp 286. Of course, such cosmic interactions are now appreciated as a common part of the evolution of galaxies.